Food Costs > How Much Does Albertsons Fried Chicken Cost? How Much Does Albertsons Fried Chicken Cost? Albertson’s, one of the leading retail grocery stores in the United States, operates more than 2,500 stores in 37 states, and the fried chicken is considered a point of pride for this supermarket chain. Whether you are having a family reunion occasion or an end-of-summer party that involves fried chicken, Albertson’s has got you covered. How much does Albertson’s fried chicken cost? The average price for eight pieces of free ranged fried chicken is $6.99 at any Albertson’s grocery store. The eight-piece will include two wings, two drumsticks/legs, two thighs, and two breasts. The chicken bucket, which includes two pounds of chicken wings or chicken tenders and one pound of potato wedges, retails for $10.99. As for bulk orders, refer to our table below to see what we were quoted. These party packs will come with breasts, thighs, drumsticks and wings. NOTE: These prices were accurate as of 2017, and these prices could vary depending on your local location. We highly recommend using their official pricing sheet to see what you will pay at your local location. Inside the store, you can choose chicken that’s already cooked from behind the counter, or depending on the day, there may be options beneath a heat lamp in a display case near the counter. You can either choose from the fried or grilled option. The store claims that it fries new chicken every 20 minutes; however, for large orders, such as the 100+ piece, the chicken will be made for your order, and you will more than likely be asked to come in at a certain time to pick up your order. Depending on your order, the fried chicken may come in a large bucket or in a plastic container. You can add extra side servings to go with your chicken such as a macaroni salad or potato salad for an additional charge. The deli has many options to go along with your meal. While optional, if you are going to serve fried chicken at a large party, then you should consider a large tin container to serve the chicken. The average prep time for 100+ pieces is 12 hours. 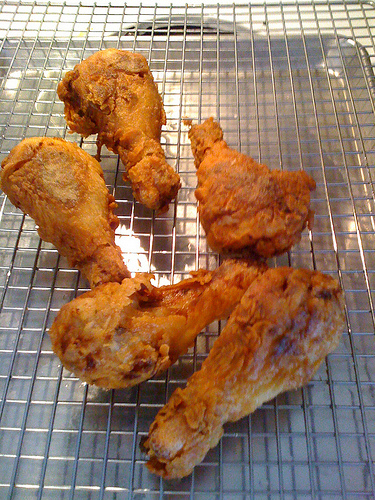 The crust of Albertson’s fried chicken is said to be very crunchy, but it is not burnt or overcooked, according to those who are “addicted” to it. There is plenty of crust which is very thick and flavorful. The fried chicken is quite salty but also very tasty, like most other fried chicken chains. They also include some special spices that add to its delectable taste. If ordering 50+ pieces, the store allows no substitutions. Consider buying discounted Albertson’s gift cards on Raise.com. If you’re going to shop, you might as well save a few more dollars. The store often runs promotions. For example, at the time of this publishing, they had a $7.99 chicken dinner deal every Monday, which included one rotisserie chicken or eight pieces of fried chicken, one pound of potato wedges, one pound of your choice of a side (potato salad, macaroni salad or Cole slaw), four king Hawaiian rolls, and a 2-liter coke product. You can also look out for Albertsons Coupons online as these can help you get discounts on fried chicken orders. The more chicken you order, the cheaper it will be per piece.